Abstracting/Indexing: Science Citation Index, Science Citation Index Expanded, Material Science Citation Index, Polymer Contents, etc. 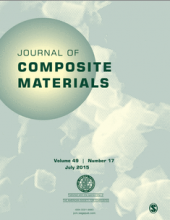 The Journal of Composite Materials is the leading journal of advanced composite materials technology and is now published 26 times a year. Major areas covered include: CAD/CAM, Ceramic-matrix composites, Coatings, Damage mechanics, Design of materials and components, Environmental effects, Metal-matrix composites, Modeling, Non-destructive evaluation, Polymer-matrix composites, Processing and manufacturing, Properties and performance, Prototyping reinforcement materials, Repair, Testing, Thermoplastic composites,Nanotechnology. All submissions to the journal must be submitted online at https://mc.manuscriptcentral.com/jcm.